Race two looked to be a repeat performance as Noriyuki Haga tried his disappearing act, taking the lead for the first five laps. It didn't last though, as suddenly he had a serious challenge from local hero, American Ben Bostrom ! 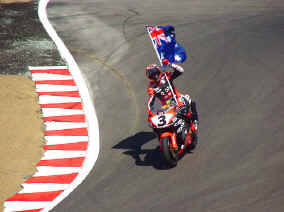 "Boz" took over the lead and dragged Australian Troy Corser up with him. Bostrom led for the next series of laps, charging unbelievably hard. He was taking wild lines through the corkscrew and really riding the wheels off his Ducati ! At one point it looked like Ben might be pulling a small advantage, but Corser fought back and managed to dispatch Bostrom. When American Colin Edwards put his Honda RC51 past Haga on the 17th lap...a four-way scrap started that ultimately saw Corser break away. Suddenly, Haga counterattacked with three laps to go, dispatched Edwards, caught Bostrom and then stuffed him in the final turn to take second behind Corser !! The Australian Flag's Flyin' in 'Fornia !!! Corser Cracks The Whip... HARD !! Raced With A Broken Collarbone ! racers and their sponsors ! !